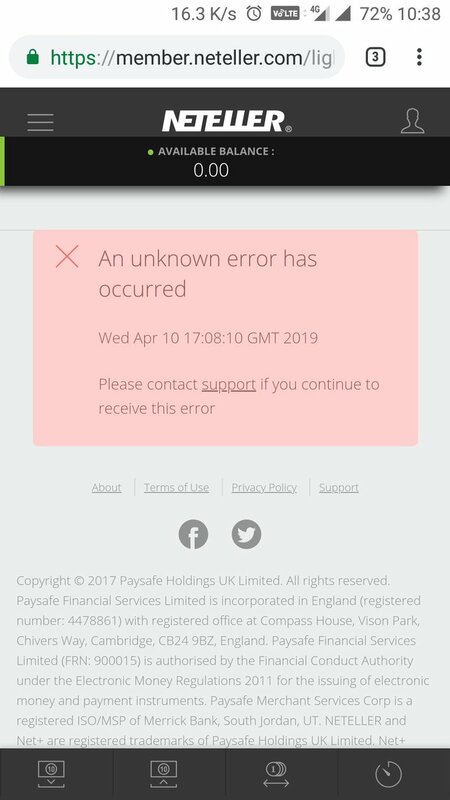 Is Neteller Down Right Now? @NETELLER i have a problem to login my acount.. anybody of soport? @bet365 hi! Have you stopped Neteller as a payment method? When I tried to deposit “Neteller is currently not available” message comes. @NETELLER Neteller ID:454025164538 Can't verify address. Pls help. Email not responding. @NETELLER Can i get (UA or RU lang) support call for me? @NETELLER website and app down? @NETELLER I can't make a deposit from bitcoin there is no option. ¿it is a temporal problem? or is permanently dissabled. @NETELLER I wish to close my neteller account but I can't login why? @NETELLER Hi guys, I changed my phone. Now, I want to log in but I can't get the unique one-time authentication code. Can you help me? @askNETELLER Is there an active support email?